On this week’s Supergirl Radio, your hosts Teresa Jusino and Rebecca Johnson are joined by special guest Bob Fisher of Superman Forever Radio to discuss Supergirl’s final appearance on Justice League Unlimited in “Far From Home”. Join in on the fun as the gang at Supergirl Radio prepare for CBS’ Supergirl, starring Melissa Benoist! I don’t know why, but I can’t get the idea of Clark and Jimmy as brothers-in-law out of my head. If Clark and Lois were married, I think the Lanes and Kara would know one another… so they’re probably not, maybe? DC did try a 2-season animated Legion TV show in 2006-2008… the second season is worth checking out, but it’s largely a footnote everyone forgets. Wouldn’t that be wild if Clark and Jimmy were brothers-in-law? Imagine the dinner conversations! I wonder if they’ll address the Lois and Clark issue on the show? Lucy could name-drop them without having to make a big deal out of it. 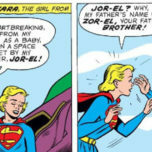 Kara might not spend a lot of time with Clark? Seems like she’s closer to the Danvers than anyone so there’s a possibility she doesn’t know the Lanes personally, but maybe knows OF them. There’s also the possibility that maybe she’s met Lois, but not Lucy. But, then she had never met Jimmy…James…or Cat either so she might not be pals with The Daily Planet folks. That’s right! There IS a Legion cartoon! Gonna have to look into that because I’ve only seen like, two seconds of it. Totally forgot about it!